Anyone that has every looked at an uninstalled bath tub has seen the insane amount of unused space. Underneath of those tubs is just air and the same along those walls of the tub in most cases. Well one company decided to actually use that space for something constructive. Instead of leaving them as open air, there are hidden compartments on this Stowaway Bathtub. I really hope that the compartments are heavily sealed off to prevent water from spilling in when you have a little kid that gets a little overexcited with their game of battleship. 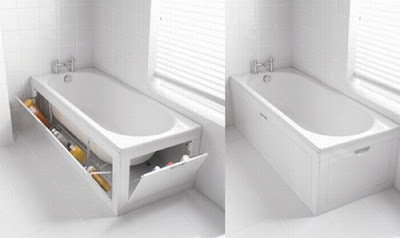 The compartments can hold all sorts of toiletries or extra supplies for your bathroom. It’d be great for a bathroom that is a little short on size. These GW International creations are supposed to start hitting stores right on the first of September. I imagine they won’t be cheap, but they would be pretty handy.